The inaugural LEAD programme (Leaders in Extractives and African Development), spearheaded by UCT, promises to equip a new generation of African mining professionals with skills needed to become leaders in the responsible extraction of minerals in Africa. The 2019 LEAD programme brings together 23 young professionals from the public and private sectors of 14 African countries, including Uganda, Madagascar, Zimbabwe, Malawi and Ghana. 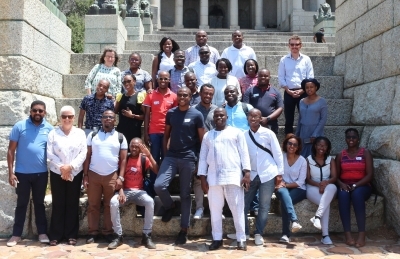 The candidates were selected from 295 applicants from all over Africa and are participating in an intensive two-week programme in Cape Town from 26 January to 9 February. UCT Adjunct Professor, and lead organiser for the programme, Caroline Digby explains that the first week includes a range of immersive learning workshops and seminars designed to give participants an in-depth insight into the context of responsible mining in Africa, while the second week provides them with an opportunity to pursue specific lines of enquiry at the Mining Indaba. “I am proud to say that the programme includes an array of distinguished African thought leaders,” she says. Professors Camaren Peter and Richard Calland of UCT’s Graduate School of Business will present on the future fitness of Africa as a continent and the importance of multi-stakeholder processes, Dr Kojo Busia from UN Economic Commission for Africa will focus on how Africa can leverage more value from its mineral resources. The group will also hear from Hélène Smit on Depth Leadership, Thabani Mlilo, head of Sustainability for Anglo American Platinum, Saliem Fakir from WWF among others. In addition to the support from Mining Indaba, the programme is funded by Anglo American, German Development Cooperation, the Australian Dept for Foreign Affairs & Trade, and the World Bank. The programme has its genesis in the Australian-funded Emerging Leaders in African Mining (ELAM) programme, which ran from 2014 to 2016. One of the participants is Dr Thandazile Moyo, a chemical engineer who originally comes from Zimbabwe. “I hope that participating in the LEAD programme affords me the opportunity to develop my own leadership skills, equips me with skills of how best to influence decisions and contribute to developing a future fit workforce for the minerals resource sector,” she says. In the future, Moyo hopes to be able to influence and support the development of the extractives industry through research and through building capacity. “Being a chemical engineer I have a strong technical background, but I am interested in being able to understand and work in the science-policy and governance development interface,” she says. This blend of real-world pragmatism with a focus on ‘softer’ skills such as communication skills is an important element of the programme. “My hope is that these two weeks will provide an opportunity for these future industry leaders not only develop professionally but also to have the chance to network, reflect and experience innovative learning,” says Digby. After Indaba, a debriefing day will be held. Participants will have a chance to reflect on their learnings, give feedback on the programme, share their experiences and plan continuing peer support and engagement.